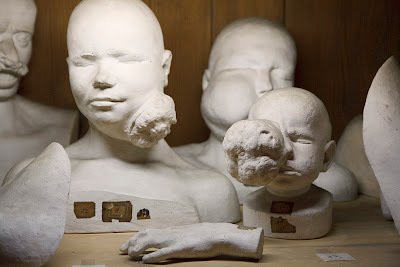 People often ask me how I first became interested in the topics that would lead me to launch the Morbid Anatomy blog and related projects, such as The Secret Museum and Anatomical Theatre exhibitions. When I am asked this question, I usually rattle off a few of my major serendipitous inspirations: my first trip to Europe and the death-symbolism-packed churches and osteo-architecture I was surprised to find there; The gift of a Mütter Museum Calendar for my birthday one year from a well-meaning friend; And, last but never least, the discovery of Stephen Asma's wonderful, incredible, perfect book Stuffed Animals and Pickled Heads: the Culture and History of Natural History Museums. Asma's book has had such a profound impact on my work that it is difficult to exaggerate its importance. The book is a conversationally toned yet extremely scholarly "natural history of natural history museums," covering, with wit and intelligence, the history of specimens preparation and the artists and pioneers of the medium, the evolution of the museum from Cabinet to comparative anatomy collection to today's science museum, the history and follies of taxonomy, and what the drive to order the world reveals about human nature. Over the course of the book, Asma introduces us to a number of incredible museums I have now--inspired largely by this book!--visited and photographed many times, such as London's Hunterian Museum and Paris' Hall of Comparative Anatomy, and all this in an accessible, enthralling, humorous, and fascinating way. This is why I am so extremely delighted that Stephen Asma will be visiting Observatory this Thursday, April 22, to deliver his much-anticipated lecture "Museums, Monsters and the Moral Imagination." This heavily-illustrated lecture will draw on the scholarship of both Stuffed Animals and Pickled Heads and new book, On Monsters, to examine how science museums and monsters both illustrate the essential yet problematic human "urge to classify, set boundaries, and draw lines between the natural and the unnatural the human" and to "try to excavate some of the moral uses and abuses of this impulse." Both of Dr. Asma's books will be available for sale and signing at the event. Full details follow; hope very much to see you there!